Lessons on Food, Life and Photography with Beaumont Newhall. Numerous contributing writers and photographers. Radius Books, Santa Fe, 2008. 160 pp., 28 tipped in duotone illustrations, 7¾x10½". Signed by Janet Russek and David Scheinbaum. One evening in 1956 our friend Andrew Wolf burst into our house in Rochester with the startling news that he had bought a weekly suburban paper, The Brighton-Pittsford Post. He explained that he planned to report local news and publish columns on a variety of subjects, such as reviews of the theater, concerts, motion pictures and cooking.“You’ll be the food editor,” he told me! “What! I can’t do that!”“Why not? I know you can write because I like to read it. 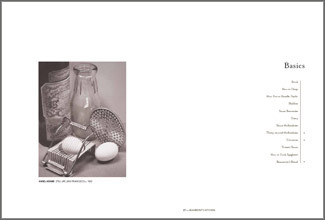 You can cook well, because I like to eat it.”—Beaumont Newhall, Focus: Memoirs of a Life in Photography, 1993. Often referred to as the “Father of Photographic History,” the legendary curator and critic Beaumont Newhall was known by his intimate circle—which included Ansel Adams, Edward Weston and Henri Cartier-Bresson, among many others—as a great chef and a gracious host. This beautifully designed volume, with images printed in deluxe duotones, contains a key selection of articles and recipes culled from Epicure Corner, Newhall’s weekly column for The Brighton-Pittsford Post, which appeared in the Rochester, New York, newspaper from 1956 to 1969. The columns are accompanied by a selection of photographs by Berenice Abbott, Ansel Adams, Henri Cartier-Bresson, Beaumont Newhall, Janet Russek, Ralph Steiner, Paul Strand, Todd Webb, Edward Weston and Minor White. Essay by David Scheinbaum. Contributions by MaLin Wilson-Powell, Amy Conger, Christopher Rocca, Jeanne Adams, Milton Esterow, Diana Edkins, Stuart Ashman, Elizabeth Glassman, Thomas Barrow, Mary Alinder and Bill Jay. The limited edition of Beaumont's Kitchen is limited to 30 copies, each of which comes with 1 signed and numbered photogravure. The print, titled Prints and Fruit, measures 14 x 17 inches (with an image area of 8 x 10 inches) and has been printed by master printer Jon Goodman. View photogravure limited edition print. 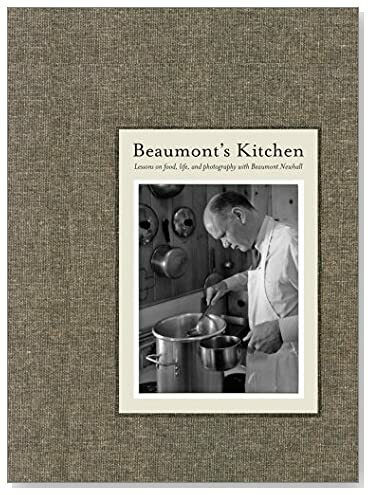 The deluxe edition of Beaumont’s Kitchen is limited to 5 copies, each of which comes with an original gelatin silver print by Beaumont Newhall. DP865-LTD Limited Edition is no longer available.